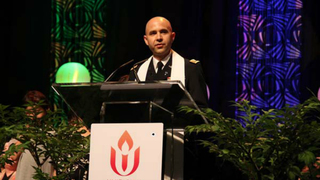 “I Refuse to Support U.S. Armed Drone Policy”: Army Chaplain Reads Resignation Letter to Obama | Democracy Now! This is Democracy Now! When we come back, we hear more about the story of Kalief Browder. Kalief, a 16-year-old arrested in New York, falsely accused of taking someone’s backpack, he spent three years at Rikers Island without trial. Ultimately, he was released. He would commit suicide a few years later. Today, we bring you Part 2 of the story of the life and death of Kalief Browder. Then, the former president of the Maldives, known around the world as a voice dealing with climate change, now freed from the Maldives. He’s gotten political asylum in Britain. He’ll speak to us from London. Stay with us.